Achieve brand success with smarter change management and seamless transformation Seamless is a guide for transforming your brand and heroically taking your business into the future. Customers are sick and tired of the inconvenience, friction, arrogance and grating seams they experience on their customer journeys caused by brands undergoing awkward and haphazard change. This book shows you how to remove the external and internal seams for a smooth transition between marketing channels, to provide a transformative customer journey. Anders Sorman-Nilsson, futurist and author of Digilogue, reveals the key factors to designing a cohesive and agile brand that is fit for the future. This book looks at on-the-ground implementation of Digilogue ideas, giving you a first-hand account of how emerging technology has evolved and disrupted the business landscape since 2013. You'll learn the trials and tribulations of omnichannel marketing, change leadership, start up thinking versus a heritage (and family) business legacy and why there has never been a better time to implement seamless technologies in your business. The future doesn't unfold neatly in fact, it's often a disruptive slap in the face. Seamless is the key to a successful business future, and this book shows you how to make seamlessness work for your company, starting today. Communication channels continue to proliferate, and simply adding every new flash in the pan is a sure path to ruin. You need to bring together every part of your brand into a cohesive whole, one with deliberate, strategic structure and wholeheartedly gather all your stakeholders around it. 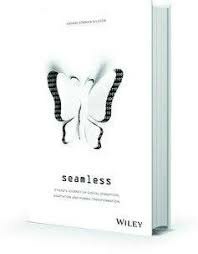 Seamless shows you how to remove the scar tissue, reveal your brand's fresh edge and meet the future curious, agile and open-minded. If you would like to know more about Anders Sorman-Nilsson and his presentation title, SEAMLESS click here to submit your enquiry, or contact us directly on 1300 55 64 69. Anderson Sorman-Nilsson (LLB / EMBA) is a global futurist and innovation strategist who helps leaders decode trends, decipher what’s next and turn provocative questions into proactive strategies. With an average of 240 international travel days a year, Anders’ view is that the future and the now are converging in a city or start-up near you, giving the curious, the creative and the courageous a competitive and sustainable edge. At the same time, that same future contains fearsome forecasts for futurephobes. Read more.